The week before the GW Health Sciences Graduation Celebration, Mary Corcoran, Ph.D., OTR/L, FAOTA, associate dean of faculty development for health sciences and professor of clinical research and leadership at the GW School of Medicine and Health Sciences (SMHS), was looking for a photo of her now 96-year-old mother to post on Facebook for Mother’s Day. 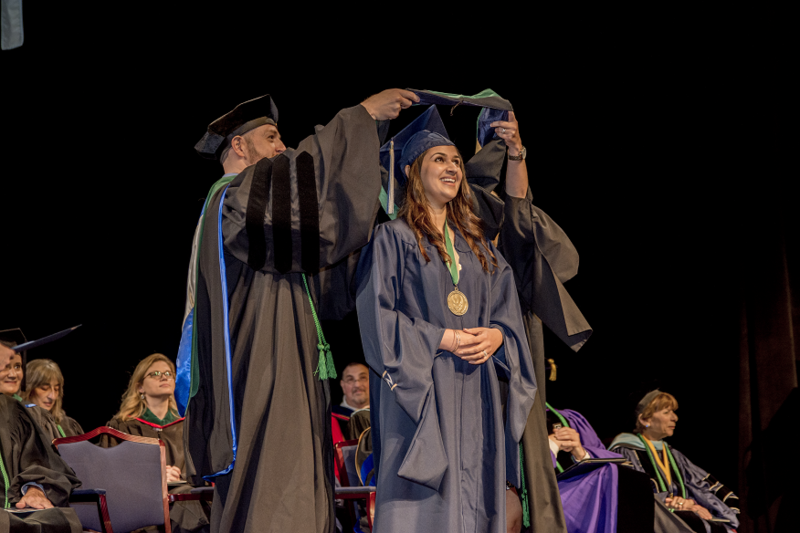 Corcoran, whose story kicked off the May 14 celebration, spotlighted one quality that was characteristic of those who had pursued and were now receiving their degrees: perseverance. Palmer, who has been deployed to Iraq and Afghanistan three times, added another honor to his name at the ceremony: recipient of the Outstanding Student Award. Along with Palmer, Daniel Peck, M.S.H.S. ’16, demonstrated excellence, as well as a broad humanistic streak. Peck, a father of four boys, worked full-time at Otsuka Pharmaceutical while pursuing his degree in health care quality, and his work focused on improving organizations to empower those most vulnerable, including those with mental health issues. The Health Sciences graduation celebration also highlighted the lasting impact of Ozgur Ekmekci, Ed.D., former interim chair and associate professor of the Department of Clinical Research and Leadership at SMHS. The first recipient of “The Ozgur Award,” Erica Millett, M.S.H.S., PA ’16, was noted for being “positively, persistently pushy,” particularly with fundraising. Millett, who embraced leadership roles as a student, was unable to accept her award at the diploma ceremony; she flew to San Antonio, Texas, the night before to present the Student Academy of the American Academy of Physician Assistants report at the American Academy of Physician Assistants annual meeting. The second recipient, Olga Terekhina, M.S.H.S. ’16, B.S.H.S. ’12, a “team-oriented and compassionate” distance education graduate, serves in the U.S. Armed Forces. Her capstone explored mobile technology as a way to improve health care education and diagnosis, and she has received multiple leadership awards and academic honors. Following the presentation of awards, the members of the Class of 2016 crossed the stage to receive their diplomas from Jeffrey S. Akman, M.D. ’81, RESD ’85, vice president for health affairs, Walter A. Bloedorn Professor of Administrative Medicine, and dean of SMHS. Joseph Bocchino, Ed.D. ’03, M.B.A., senior associate dean for health sciences and associate professor of clinical research and leadership at SMHS, drew on his own personal experiences with perseverance in his charge to the students, after they had recited the SMHS pledge. “I started out in health care [by] cleaning patient rooms in 1980,” he said. “I kid you not.” Bocchino, who gave his last charge as senior dean this year, also encouraged the graduates to build on their education to effect change through leadership. As he closed, and as the students prepared to process out of the auditorium and into a world where they would no longer be hard-working students but hard-working professionals, their families and friends broke out into applause.